The first broadcast of the Deprogramming Center's MAGNETIC BUNGALOW will feature the 1989 cassette album: Mood Swing Shift by Mental Anguish. This event will take place Saturday, May 5, 2018, 12:00 AM USA Pacific Daylight Time on KOWS, 92.5 FM (that's Friday at Midnight), coming your way from Occidental, California, via Kansas City, Kansas. (see details over on the right side of this page for links). 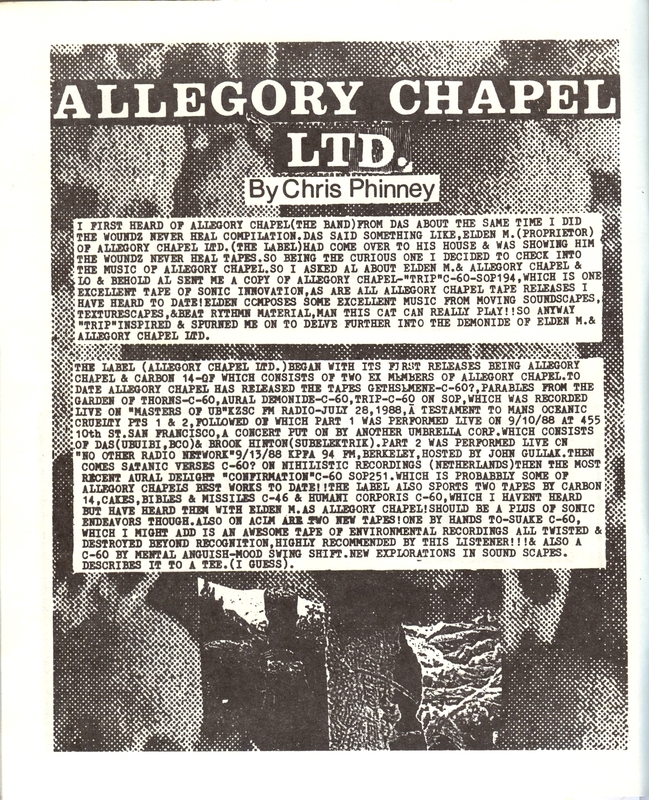 And here's a little teaser -- check out this chunk of a 1989 Harsh Reality Music catalog and note the promos for the ORIGINAL PRINT VERSIONS of Electronic Cottage #1 and #2. 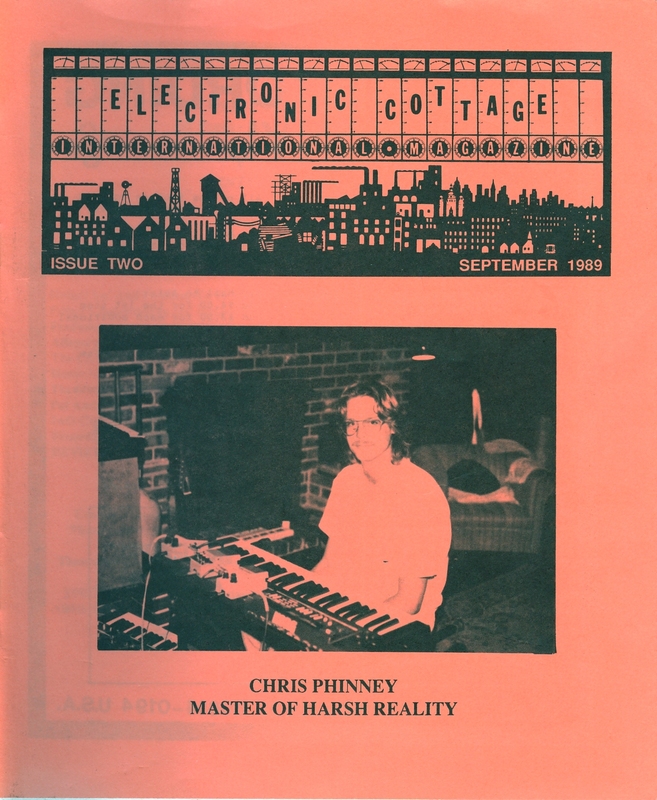 As some of you might know, Chris Phinney/Mental Anguish's photo is on the front cover of Electronic Cottage #2, and he mentions Mood Swing Shift on page 18 of the mag. See ya at the Bungalow. Thank you so much for featuring this tape on the show! You did an excellent job on the show! Your MAGNETIC BUNGALOW drawing is just great! A great invitation to your radio show. Glad you dig it, Wolfgang! And I'm betting that that laundry washer of yours keeps your cassettes sparkling! A quick visit to your website reveals quite a bit of activity of yours out in Linz -- you are a busy and creative person. Oh, and I hope you enjoyed Mood Swing Shift too! This was an hour well spend, I really enjoyed the show! I recently discovered Chris's work and I imagined that, 'Mental Anguish' would sound way harder! But, I already got proven wrong with his 'Frozen Lake'-album and again with 'Mood Swing Shift'. Great broadcast and great music! We are lucky to have your well curated show on KOWS Charles. Thanks! Always unique, always intelligent and never less than superior. I'm honored by your positive reinforcement, Mr. Campau. However, I am just a performer in the KOWS circus, and I would have no opportunity to share my offerings were it not for your efforts as Ringmaster of KOWS programming -- so I tip my humble hat YOUR way and praise your unwavering efforts to hold KOWS together under the constant challenges of its Rodeo of Potential Chaos! Wonderful! I am enjoying it!